Bestiaries were created in the Middle Ages to catalogue the various creatures that lived around the world. They would include various animals like horses and lions, along with more fantastical creatures such as dragons and unicorns. Here are ten creatures that are less known but have unusual characteristics. Some were based on real animals, while the origins of others remain a mystery. They were considered to be so strange during the Middle Ages that Pope Innocent III banned Catholics from eating of these geese during Lent. 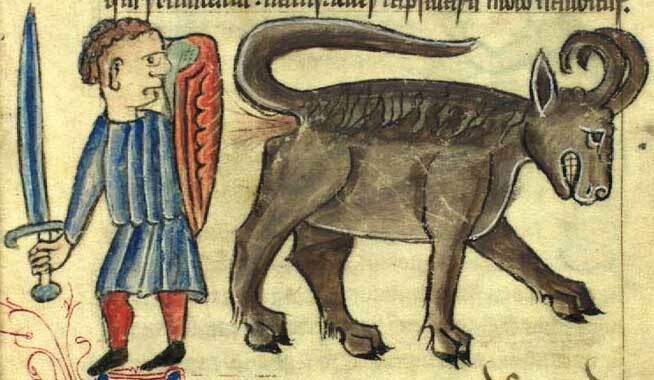 According to the Aberdeen Bestiary, “in Asia an animal is found which men call Bonnacon. It has the head of a bull, and thereafter its whole body is of the size of a bull’s with the maned neck of a horse. Its horns are convoluted, curling back on themselves in such a way that if anyone comes up against it, he is not harmed. The hydrus lived in the Nile River and was the enemy of the crocodile. When it sees a crocodile sleeping with its mouth open, the hydrus first rolls in mud to make itself slippery, then enters the crocodile’s mouth and is swallowed. It then eats its way out of the crocodile’s belly, killing it. According to Brunetto Latini the Parandrus lived in Ethiopia and had the tracks of an ibex, the branching horns of a stag, the colour of a bear, and, like a bear, it has a shaggy coat. It is believed to change colour into a likeness of whatever it is close to.